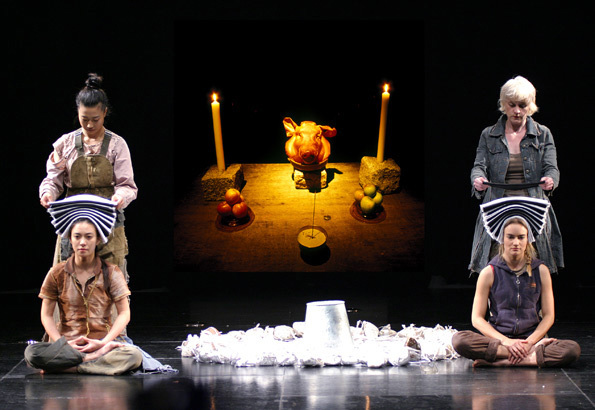 A theater research on the korean myth of the origin of the first Shaman Princess Pari. An encounter between korean and german actresses. overcomes this trauma by being initiated in the "underworld" to the first shaman. The profession of a shaman as a performative medium of gods and spirits, in analogy to the actress, who makes herself the medium of her role, "embodying" an imaginary personality. Both practices combine aesthetic and therapeutic subjects to bring back the "dead" soul out of the "underworld". 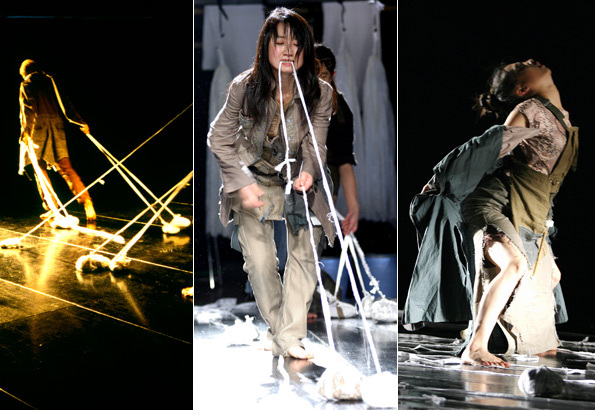 9 weeks Encounter between four Korean actresses from Seoul and three actresses from Berlin. 9 weeks trans-Lation from German to Korean & from Korean to German. 9 weeks which brought language off the rails, often letting it say something else than one was expecting. 9 weeks which brought into oscillation the relation between YOU and ME; brought into oscillation the different perceptions, the different ways of understanding, the different ways of acting of korean and german actresses. 9 weeks Encounter with themes that are givven by the origin myth of the shaman from Korea : where do I come from, to kick off ones own child, the relationship between daughter and father, the enduring of ego-death, surrender and devotion, the mirror of love, the water of Life. 9 weeks which opened the tubes of intercultural communication: near strangers and strange friends. 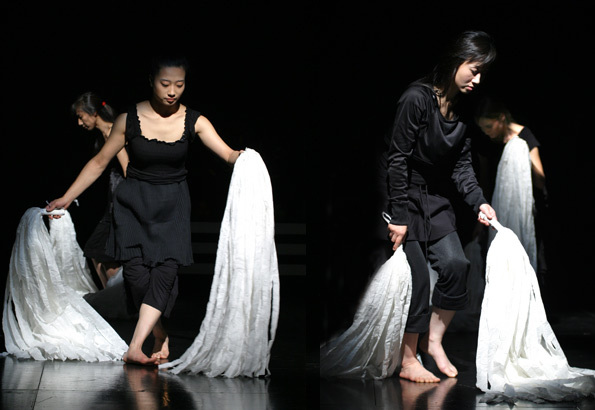 Making a performance in the frame of an intercultural research- and exchange project is a task with very specific demands. Opening new doors of perception and developing tools of creation together was our priority. 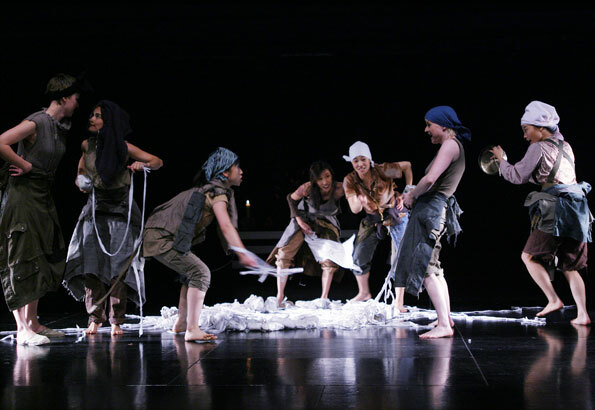 The purpose is to open up for the experience and performance of a more authentic language of theater and expression, to nourish an intuitive flow of creative power beyond the personal and technical movement. ... To step into an intercultural reading of the fluctuating landscapes of performing arts : basic elements like perceptual and aesthetic awareness, sensorial body-mind balance, centering, transformation of energy and creativity, release technics such as breathing-whirling-jumping, rhythm, radiance and gravity, strength and flexibility, singing-chanting-screaming, improvisation, composition - to extend the psycho-physical-spiritual expression to a more vivid and wider range. Excerpt from "The lost Princess"
The stream of time flowing there. "Get the oracle, the oracle bring!" and the soup seemed to her like immature bean paste. The signs of maternal happiness! She slept under blankets of silk, her head was resting on golden pillows. but she had not the strength to rise. It seemed as if her hips were melting. threw the sticks of coral onto a tray of white jade. The first litter showed the buzz of ten thousand spirits. The second litter showed the verdict of the upper and lower gates. that really concerned the issue of the king. "If the king had married in the year of great happiness"
"A royal descendant would have given to him. his first child will be a girl. " But what do you know already?" The king replied. and gave his first daughter the name Peach Red Moon. 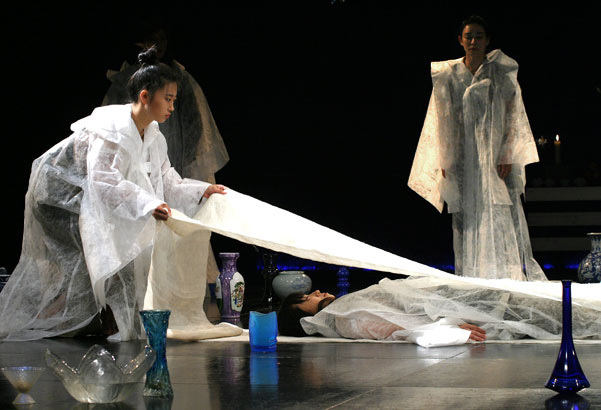 Produced by THEATER SALPURI Berlin, THEATER IN BETWEEN Seoul, WERKSTATT der KULTUREN Berlin. 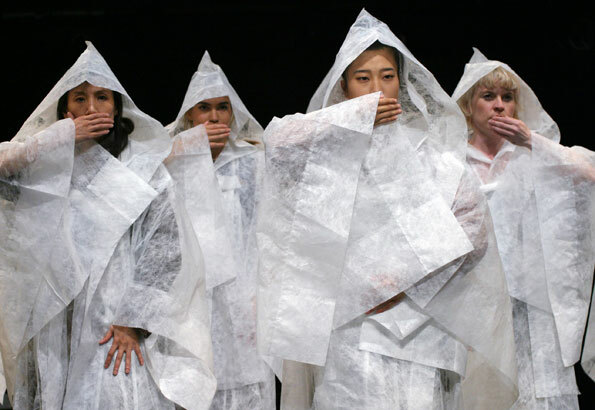 Supported by: Hauptstadtkulturfonds Berlin, Deutsche Klassenlotterie, Haus der Kulturen der Welt Berlin, Korean Ministry of Foreign Affairs, Korean Ministry of Culture and Tourism.